Former Color Me Badd front man Bryan Abrams uses a walker for his court appearance to face domestic violence charges. A judge in Oklahoma has continued the court case filed against former Color Me Badd frontman Bryan Abrams, who's accused of not complying with terms of his probation in a domestic abuse case. 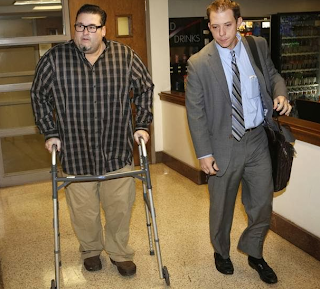 The 44-year-old Abrams appeared in court Wednesday, pushing a walker. His attorney, Matt Swain, says Abrams recently had hip surgery and has been plagued by health problems. An arrest warrant was issued for Abrams in February for failing to comply with terms of probation he received after pleading guilty to domestic abuse in 2012. Swain tells The Oklahoman (http://bit.ly/1aIAggL ) that his client is "trying to get his life back together now." Abrams was ordered back in court in January. Color Me Badd's hits in the early 1990s included "All 4 Love" and "I Adore Mi Amor." WTF happened to this guy? Damn its hard times for everybody!! Dude looks like he's been sitting on his sofa, eating cheetos, take out and playing playstation for the last 20 years. She must have tried to take some of his food away.